Instead of grilling your steak, you can try pan fry steak for a change or if you just don’t want the smell of the charcoal burning. You can also have it as a sizzling steak by using sizzling plates. 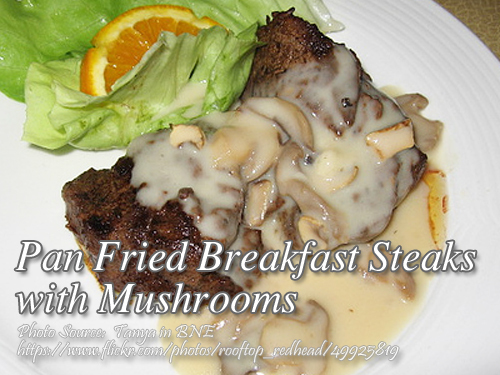 To cook pan fried breakfast steaks with mushrooms; Season beef breakfast steak with salt, liquid seasoning, ground pepper and calamansi juice. In a heavy pan, heat butter and fry the steaks on both sides until brown. Transfer steaks to a platter and set aside. In the same pan, add fresh whole oyster mushroom. Saute for a while then stir in beef bouillon cubes and dissolve in butter. Thicken with flour. Cook for about 1 minute then pour in milk. Let boil. Then pour the sauce over steaks. If you want to have a sizzling steak, heat the sizzling plates on a stove until hot. Put the steak then pour the sauce over to have a sizzling effect. Garnish with parsley or scallion. Season beef breakfast steak with salt, liquid seasoning, ground pepper and calamansi juice. In a heavy pan, heat butter and fry the steaks on both sides until brown. Transfer steaks to a platter and set aside. In the same pan, add fresh whole oyster mushroom. Saute for a while then stir in beef bouillon cubes and dissolve in butter. Thicken with flour. Cook for about 1 minute then pour in milk. Let boil. Then pour the sauce over steaks. If you want to have a sizzling steak, heat the sizzling plates on a stove until hot. Put the steak then pour the sauce over to have a sizzling effect. Garnish with parsley or scallion. pwedeng tagalog version para sa pag hahanda ng mga lutuing ito? salamat po. How many serves this recipe? wow sulit po ang menu na ito sa special na occasion o.ty po ..
ask kolang po sana if ano po ba ang pwedeng luto sa baka bukod po sa nilaga,,lalo po sa kasal na occasion po.